Pond has frozen and the marshmallow man is about to take a topple on the ice! After spending weeks looking for the perfect gingerbread house and decorations..We decided to start from scratch! We travelled far and wide to find some of the things to make this gingerbread house special (We had to go to Germany for some of the candy and inspiration!) We aren't the most experienced as we are very young! (12 and 11 years old!) 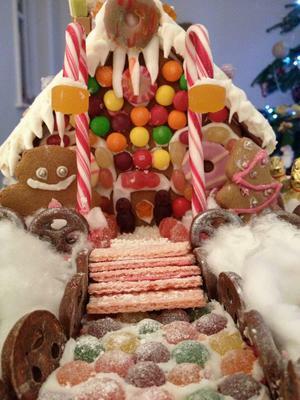 But we are very proud of the outcome :) hope you enjoy our gingerbread house and that it inspires you to do one of your own! Please vote and comment it would mean a lot :) Merry Christmas! WOWEE!!! I am in Heaven!! What a house!! I love this house! It looks great and SOOO cute! Keep up the good work! Its lovely to enter a fantasy world for a few minutes and your house is the business. 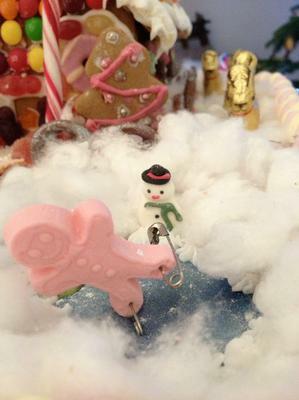 I love the attention to detail especially the skater on the ice rink. Top house!! My daughters and I love making gingerbread houses together. This has inspired us so much and your story touched my heart. I love it! 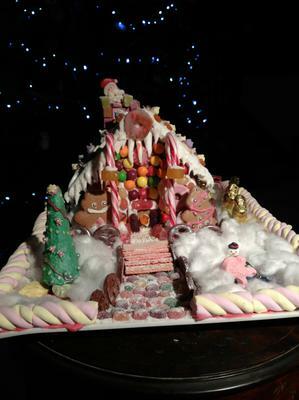 THIS IS AMAZING OMG I WANT TO EAT IT RIGHT NOW BUT IT LOOKS TOO GOOD TO EAT! OMG OMG OMG!